Natural disasters took a deadly toll in 2008, killing more than 220,000 people and causing a total of $200 billion in damages–a 50 percent increase in costs over 2007. A new report sums up the damages wrought this year by weather and geology; the deadliest disaster was the cyclone that battered Myanmar in May, killing an estimated 130,000 people and causing losses of $4 billion, and the costliest was the earthquake that struck China’s Sichuan province, killing an estimated 70,000 and causing losses of $85 billion. The new figures come from an annual assessment of global damages by the reinsurance giant Munich Re, which offers backup policies to companies writing primary insurance policies. Reinsurance helps spread risk so that the system can handle large losses from natural disasters [AP]. Munich Re has a financial interest in understanding global weather patterns, and board member Torsten Jeworrek says the uptick in losses from natural disasters is another indication that global warming is already having widespread effects. “Climate change has already started and is very probably contributing to increasingly frequent weather extremes and ensuing natural catastrophes,” he said [BBC News]. 2008 was the third most expensive year for natural disasters when the dollar amounts are adjusted for inflation, the report says: This year sits behind only 2005 ($232 billion), with its record number of Atlantic hurricanes, including the devastating Hurricane Katrina, and 1995, the year of the earthquake in Kobe, Japan [LiveScience]. Rounding out 2008’s slew of troubles were five major hurricanes that tore over the north Atlantic Ocean, including the powerful hurricanes Ike and Gustav, as well as roughly 1,700 tornadoes scattered across the United States. Munich Re’s report points out that 2008 was the tenth warmest year on record according to the World Meteorological Organisation, which means that the 10 warmest years have all occurred in the past 12. Several recent studies have suggested that global warming may not be increasing the frequency of cyclones and hurricanes, but it is making big storms more intense. Says Munich Re earth scientist Peter Hoppe: “The logic is clear: when temperatures increase there is more evaporation and the atmosphere has a greater capacity to absorb water vapour, with the result that its energy content is higher. The weather machine runs into top gear, bringing more intense severe weather events with corresponding effects in terms of losses” [BBC News]. The company believes that world leaders must put strict limits on greenhouse gas emissions to spare future generations from the wrath of even more destructive weather events. DISCOVER: Does Global Warming Really Boost Hurricanes? too bad we haven’t seen any global warming for over a decade. What idiots. Claiming no warming for over a decade ranks pretty low on the reading comprehension and reality observation. It’s only the severe La Nina that put the brakes on the rise in mid-2007. You might want to hushup on the reference to idiots. And reread the blogs that wanted you to believe in the no-warming while actually stating something else. They’re not pinning the blame on AGW, so the ref to leaving out earthquakes is cloth-eared. The real gist of the article is important – insurance premiums have to cover the cost of payouts and AGW adds to the tag. The piper is going to get paid one way or the other … or both. What I think the most likely best case scenario to follow is ‘noticeable’ elevating temperatures for the next two decades with dramatic fluctuations (unfortunately, this will further fuel the debate between global warming ‘naysayers’ and ‘doomsayers’). Temperature fluctuations will then intensify (caused by a shift in climate patterns) with significant temperature increases that will last for a generation. During this entire time, ice mass loss in Greenland and Antarctica will continue to increase & methane releases from continuing melting tundra and oceanic hydrate gasification will increase. 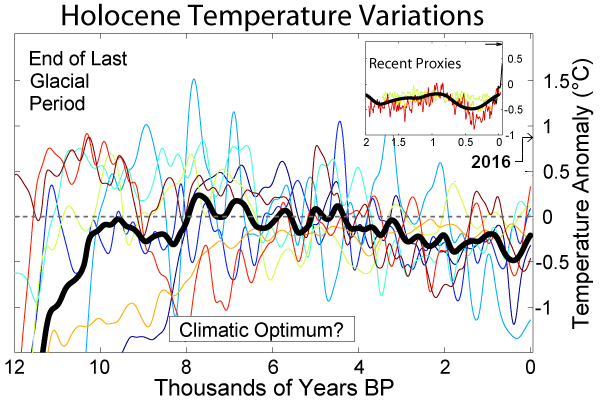 The only reason that we won’t see radical temperature increases in the near future is that we’re entering a brief naturally occurring moderating cycle. It’ll be just long enough to weaken the building of a lasting consensus to control population growth and fossil fuel use in the world. SO, by the time the another moderating period is due in two generations (after another warming cycle), they should better be able to determine the likelihood of ‘runaway global warming’. Since, regarding greenhouse gases, I’d rather err on the side of caution (and remembering that it’s “not nice to fool Mother Nature”), I favor a very strong push for renewable energy sources. Not only does it appeal to my common sense (economically), it’s also a great way to minimize escalating environmental pollution that has made cancer the number one killer in developed nations [Hint: that’s us]. Of course, I could be wrong / after all, a worldwide series of epidemics could solve the overpopulation problem that’s fueling other related problems. A conflagration in the Middle East could easily be the catalyst triggering a domino effect making this a reality. But, what the heck — after all, it’d be good for the Spotted Owl. And we knew that we’d have to either evolve into something better or go extinct anyway. Right? Earthquakes, hurricanes, cyclones, etc are not caused by global warming if there was any global warming. To owl, since there has been no increase in the planet’s global temperature since 1998 and there has been a drastic decrease in the last two years that have wiped out all the gains in the 20th century, I would say that the statement of no global warming in the last decade is accurate. You might want to try reading the temperatures from a reliable source such as UAH. Nasa fudges their figures and they keep getting caught. I wonder if the Insurance industry suffers from the same greed problem as most other industries. Offering up policies, in order to make money, against things that shouldn’t be insured: living on a flood plain, living in coastal areas prone to cyclones, typhoons, hurricanes…. The populations are increasing in these areas as the human population continues to grow. Therefore it stands to reason that there will be more damage, more people affected, and it will be costlier. All things being equal, increasing the population will increase the insurance payout. Now if we want to throw climate change into the mix, whether fact or fiction, it will likely only serve to make the costs in the insurance industry higher, unless they refuse to insure in certain areas. Until then, let the Insurance industry continue to pay! If insurance companies are having massive claims and losing money, they should do what everyone else has to do. Buy insurance! I have a question for the community. Most lead providers get their leads from online quote request and then they resell them like 4 or 5 times. I’ve been burned like this a few times already so my question is, how about telemarketing to generate insurance leads? I’ve heard good and bad things so if anyone has any feedback please let me know your thoughts before I spend even more money testing things out.